A pretty Scottish woman poses for her portrait at the Charles Reid studio in Wishaw, Scotland. 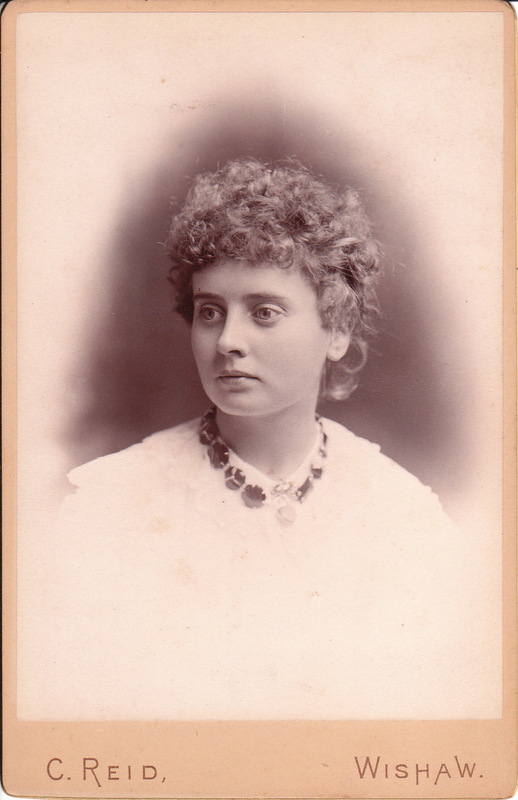 The young lady has short curly hair and is wearing a necklace. She also has beautiful soulful eyes. Printing on the reverse of the cabinet card displays drawings and descriptions of some of the medals won by the photographer. The dates of the awards span between 1886 and 1891. This photograph was likely taken in 1891 or shortly thereafter. Charles Reid (1838-1929) was a noted Scottish photographer. The 1881 census reported that he was married and had seven kids. His eldest, Charles, was fourteen years old and worked as Reid’s assistant. In 1877 Reid conducted his business in New Pitsligo. Between 1882 and 1900, Reid operated a studio on Young Street in Wishaw. Reid is well known for the many wildlife photographs that he produced. He lectured the Edinburgh Photographic Society on animal and bird photography in 1882, 1890, and 1896. He produced a book, Animal Studies, published in 1901. His son, Charles, took over the studio from his father. Later, an Andrew Reid, became the proprietor. Perhaps he was the elder Charles Reid’s grandson.